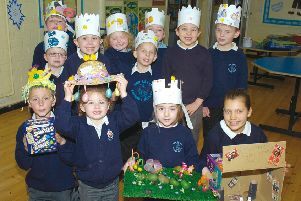 Pictured (from left) Bev Philp, of Donington's community group IDEA, Molly Hodgson, nine, Bradley Wray, four, Leah Bristow, 13, Stevie Abbott, three, and Alicia Inglis, 12. Here we see youngsters taking part in an Easter egg hunt at Flinders Park, in Donington, 10 years ago. The event also saw Coun Amanda Puttick, of South Holland District Council, present a plaque to members of the community group behind the recently opened £90,000 play area, IDEA (Improving the Donington Environment for All). Pictured (from left) Olivia Loach, nine, Nico Loach, seven, and Shannon Loach, 12. The plaque marked the contributions of Lincolnshire county and South Holland district councils towards the project.